Latte art has reached new heights in London. 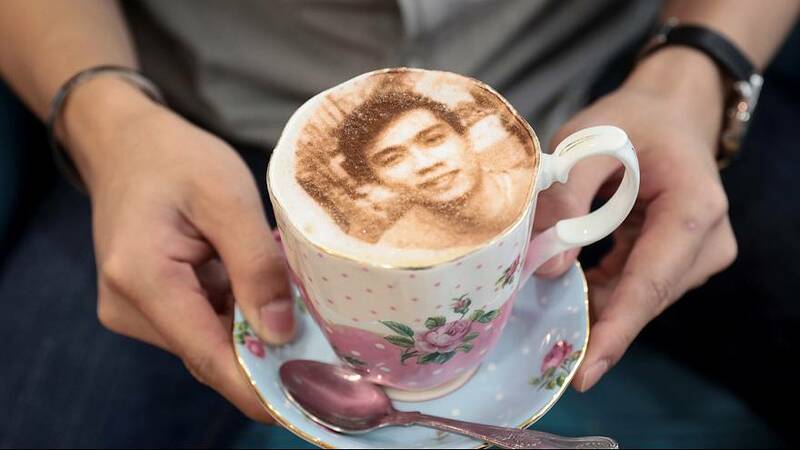 The 'Tea Terrace' cafe lets customers drink their own portrait. All you need is a photo of yourself and that the image is uploaded to the "Cino" machine. The picture is then scanned and printed onto the froth. This flight attendant discovered the cafe on the internet in Singapore before even travelling to London. Flight attendant, Safirah Safari said, "I actually heard it through Facebook back at home in Singapore when I was browsing through the Facebook and I saw one of the faces that actually shot the video of this and I actually texted my friend because we were going to London the next week so I told her let's come to this and just check it out. This is really interesting I've never seen any cafe that has a selfieccino, so it is really amazing". All you need is £5.75 for the beverage and of course a selfie. "All they have to do is send them to us by WhatsApp to our telephone number, our dedicated telephone number, then we use the phone to upload the image to the printer and then it takes one and a half minutes for the printer to actually print the high-tech image or the high-resolution image on the froth of the chocolate or the cappuccino", said the owner and CEO of the Tea Terrace Restaurants and Tea Rooms, Ehab Salem Shouly. Over 400 of the personalized drinks were sold in the first 3 days and with the hashtag 'Selfieccino', and ever since, it's been going viral across social media.